Last week I talked a lot about modesty and why it is still important today. As I was reading my Bible over the weekend, I found a passage in Colossians that talks about how we as Christians should clothe ourselves. Therefore, as God’s chosen people, holy and dearly loved, clothe yourselves with compassion, kindness, humility, gentleness and patience (Colossians 3:12 NIV). And over all these virtues put on love, which binds them all together in perfect unity (Colossians 3:14). These verses don’t talk about physical articles of clothing, but these articles can be put on by anyone, rich or poor, and make us beautiful and dignified from the inside out. 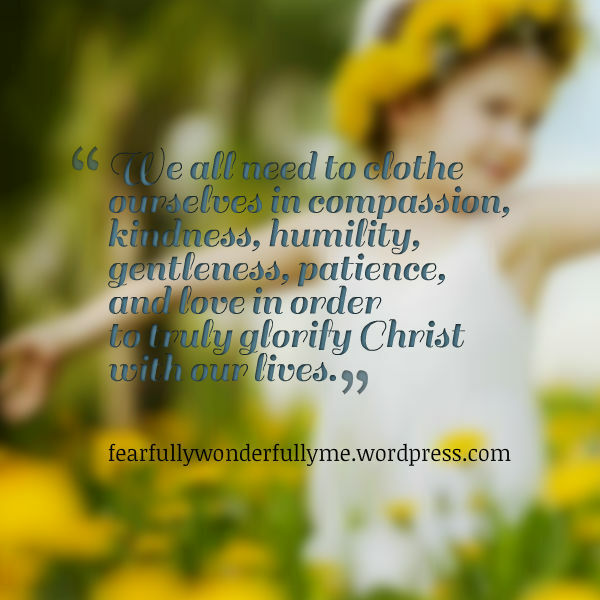 We all need to clothe ourselves in compassion, kindness, humility, gentleness, patience, and love in order to truly glorify Christ with our lives. You can think of compassion as an undershirt–close to the heart, and always grounding us. We need to have compassion to everyone, just as Christ does for us. If we do not care for one another’s feelings or put them first, then we will never be moved to help them. Compassion keeps our hearts soft so we can respond to the needs of those around us. Kindness is like a purse or backpack. It should be full of good deeds and mercy. Feel free to reach into your bag of kindness and shower everyone around you. This is the fruit that shows you belong to God. Humility is like a hat. It sits above us, so we know that our God is above us. It humbles us; not just before God, but before others. We need to remain humble to others and put them before ourselves. If we always put ourselves first, then we cannot love sincerely the way God commands us to. Shoes remind me of gentleness. We must remember that every step we take and every word we say can have an impact on those around us. The shoes of gentleness can remind us with each step to be gentle and to take in other points of view besides our own. It is a way we must walk in order to love those around us. Patience is like a necklace/pendant worn close to your heart. It touches your skin with the reminder that God is in control, and His timing is perfect. It is also a reminder we need to grasp to be patient with others. We cannot control the people around us, and we need to remember that everyone is flawed. It is important to be patient with people as we love them. This passage separates love into its own verse because it is so important! Not only do all of these other articles of clothing enable us to love others, but they are bound together by love. Love is like a belt; it must be put over all of these other virtues in order for us to live them out. If we don’t have love, then all of our attempts at living up to the other five virtues fail (1 Corinthians 13:2). Love is the ultimate command that Christians need to pursue and follow. So when you get dressed, remember to not only clothe yourselves with all of these virtues, but also to bind them together with the law of love. What a great list promoting the adorning God is interested in. How much skin is being revealed is a modern focus that has dramatically shaped our culture. But that concern is absent in both Paul’s and Peter’s exhortations about modesty. The Holy Spirit, Who inspired their views, was contrasting the motive of trying to gain self-attention by dress or jewelry or hair-style with the motive of trying to dress in virtues that attract attention to their Source, the God of love and truth. Today’s “modest fashion” wars are being fought on the soil of religious allegiances which redefined the biblical meaning of modesty with Victorian cultural standards of dress. As late as 1828, Webster’s definition of “modesty” still maintained the biblical concept, including nothing about how clothing hid the body. Your focus in this blog article, Emily, is actually the accurate biblical focus. Wow, thank you so much! As a young woman who loves fashion (I was raised in a house with a fashion loving mom and sister), I am learning more about modesty and balance everyday! Modesty truly is about the heart. You can wear a hefty bag and still not be modest. It’s about your demeanor, and how the Holy Spirit is working on you! I love how talking with other young girls about clothing can actually be a door to talking about God’s goodness. And another point that you pointed out was that modesty is also cultural. I’ve studied a little fashion history, and this is so true! This is so beautifully written and uniquely clever. I love it!